You didn't know this, but Chorley & South Ribble CCG have already proposed closing Chorley A&E in their 'Our Health Our Care' STP plans. The Clinical Commissioning Group (CCG) for Chorley & South Ribble is chaired by Dr Gora Bangi. The CCG and its partners are running a Local Delivery Program (LDP) titled 'Our Health Our Care' which is the Central Lancashire input to the regional Sustainability & Transformation Plan (STP) for Lancashire & South Cumbria. Page 10. We will clearly separate services.... from emergency and urgent care. A&E services will only be delivered in a specialist centre. 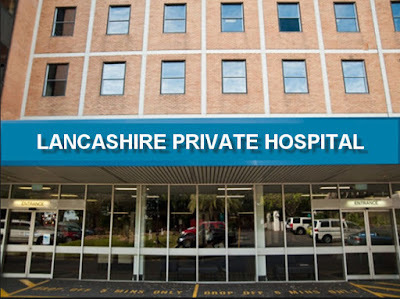 Dr Gora Bangi, the chairman of the local CCG claimed there were no plans to close A&E services in Chorley or Preston. Below is proof showing Dr Bangi's own document which clearly shows all acute emergency services have been closed & replaced with community beds. Acute/A&E services have been removed and replaced with 'community beds' on tier 3. 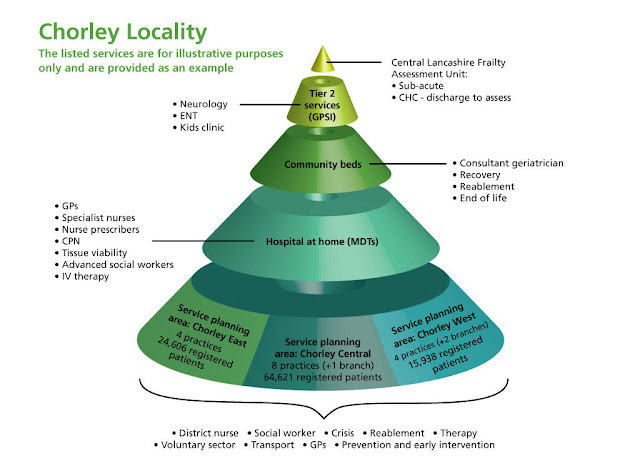 An acute model of care will sit above and support all three locality models. i.e. there is ONE A&E acute model only for the three areas. this Acute model of care will look different to its current and that it may well reduce in size from its current form. i.e. the much smaller A&E hospital will be built at Lostock hall or elsewhere. The Hospital Trust have also agreed to allow many services to be closed, here's proof..
A news article released earlier this month from the BMA claims STPs are "more than a missed opportunity", indicating they agree with aspects of the plans and don't intend to oppose them. The article (see link below), written by Peter Blackburn of the BMA news team states "We as an association have much we agree with STPs on,’ Dr Wannan - BMA"
If I recall the BMA were also resolutely against formation of a publicly owned NHS in the early days? We have to make it very clear that ALL aspects or 'models of care' proposed in these STP plans work against the interests of a publicly owned universal healthcare system. We can't just 'pick and choose' one element of the STP over another. They are all designed to lead to combined budgets founded on the private health sectors favoured 'population-based' care. 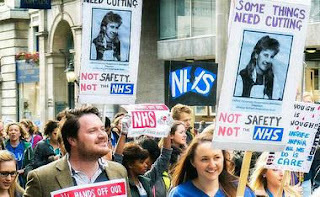 The BMA news article highlights the threat of NHS privatisation, but as with the Junior Doctor contract, offers no meaningful solution. 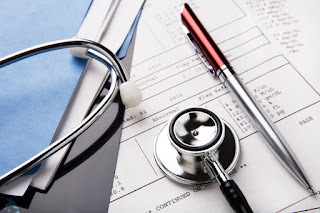 STPs are seen by the BMA as a barrier that can't be overcome, the article continues.."While the plans may be doomed – it appears they are here to stay". What exactly does this fait accompli sentence mean to you and I? Are the BMA saying the plans will be continued by the next government or we will end up with some hybrid system akin to the U.S. healthcare model where those fortunate can pay for their treatment, whilst others die waiting in a queue? Are they saying we have come to a stage where the process cannot be stopped and is irreversible or 'too expensive' to change back? 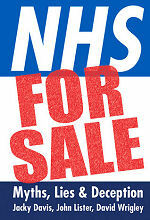 Will the NHS have enough funds to buy-back the bulk of the contracts sold off by their buyers the Clinical Commissioning Groups? One thing is for sure, here over at Chorley & South Ribble we don't do fait accompli, we don't intend sitting around on our elbows watching whilst our NHS is gradually sold off and stolen away from us. We haven't stood outside our local hospital every single week for almost a year, just to be told we're not getting the services we are entitled to and fought so hard to keep in the past. What? 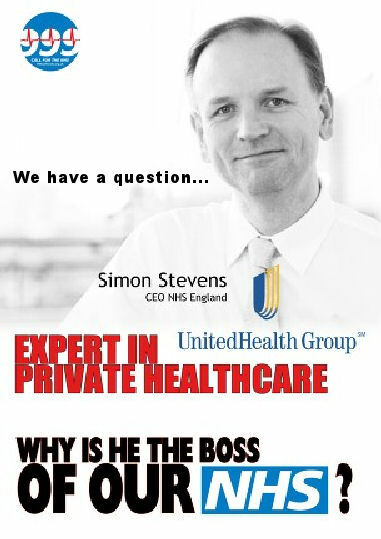 the boss of NHS England 'Simon Stevens' was a Labour Councillor in Brixton until 2002? 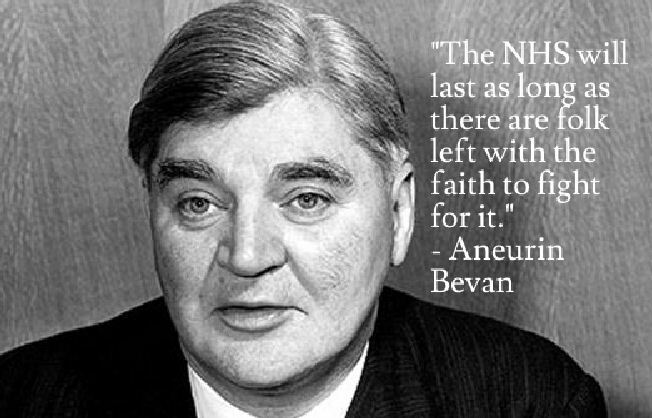 And he went on to become the boss of a private healthcare insurer? What is he doing in charge of our NHS? Not content with playing his part in killing off the only chance Americans had of having a near NHS health service [Obamacare], Simon the NHS traitor 'Stevens' is back in the UK spreading ideas about how to dismantle 90% of the NHS using the American private health systems such as Health maintenance and 'population-based care' organisations. So what the ruddy hell is he doing as boss of our NHS? 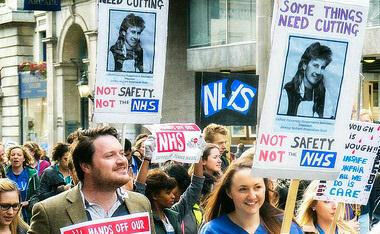 Who made Stevens the chief of the NHS ?